Earlier in the week I spotted the traffic enforcement officer (boo) and the community policewoman outside having words with the double parkers. According to the policewoman there had been 27 complaints to the police/council about the double parking which I find very hard to believe. 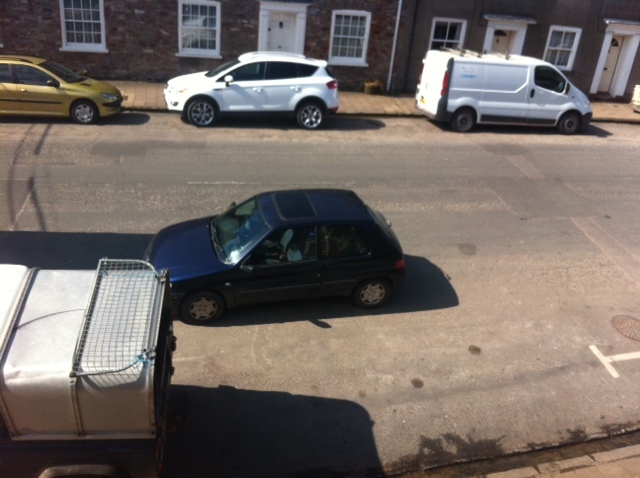 The majority of the sensible people in and around Bampton appreciate the fact that double parking in Brook Street is a unique feature adding to the charm of our town. When the police were responsible for parking issues they would turn a blind eye to the double parking as it acted as traffic calming for the street without the expense of those stupid bumps in road. When the traffic enforcement people took over they, in their usual manner, became overzealous and were often seen having a go at our customers (and those of the butches, fruit and veg, chippy, costcutters and bakers) for the double parking when there was no issue and the traffic continued to flow along the street as it is plenty wide enough. How a car can be deemed to cause a problem is beyond me when the street can cope with large lorries delivering goods to the shops. On the double parking issue only 5 people thought it an issue while four times as many said it was no problem. So where have these 27 complaints appeared from? These complainants need to understand that if the double parking was banned completely (by having a permanent TEO) then the shops in Brook St would lose business as the customers would drive on to Tiverton (probably to the supermarkets where they park for free). I would think the Bampton 27 were quite happy to move to a nice small town with shops and they probably brag about the facilities to their family and friends so they ought to consider the implications of their actions. If the traffic is moving slowly down the street they should look at why before they complain. If it is a couple of large lorries passing each other or maybe someone having oil delivered for their heating then those activities need to continue regardless. 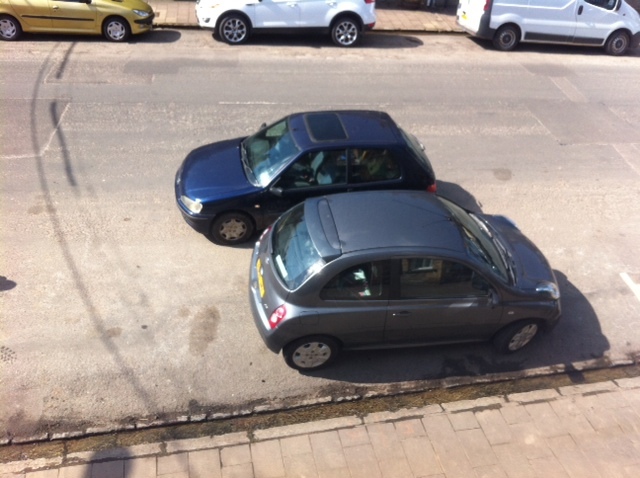 Some people have a fear of being blocked in (or is it that they cannot parallel park?). It is quite funny when someone then thinks nothing about parking inside of them. Today we had a different sort of parking issue. The opposite to double parking! 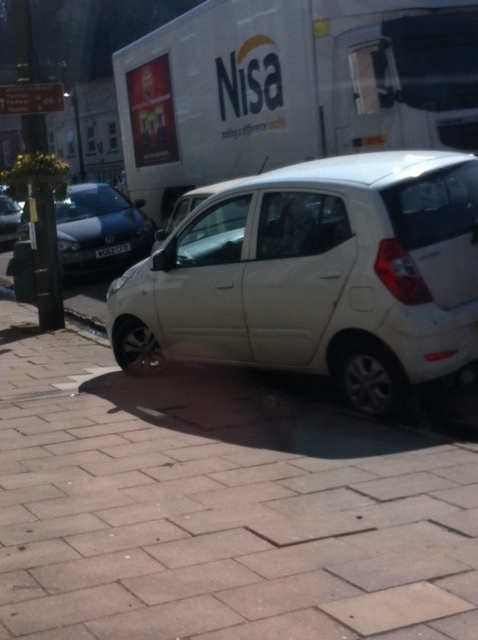 I reckon someone left the handbrake off and the car rolled down the slope and onto the pavement. Luckily (!) there was a car in front to stop it rolling even further. The car was there for several hours until the driver returned – they returned between 4:15 and 4:25 as it had gone when the Grand National had finished. This entry was posted in Uncategorized and tagged Community Police, Double Parking, Grand National, Highways Department, Parkaphobia, Traffic Enforcement Officer. Bookmark the permalink. I occasionally double park if i know i am nipping in and out of a shop or two fairly quickly. I think most people are pretty sensible and tolerant, as we all know the double parker has not gone off for a day long hike on Exmoor. I like to occasionally shop in Bampton to support local shops, even though it costs a bit more, so don’t make it more difficult please. I absolutely agree! The road is plenty wide enough for double parking – provided drivers don’t box others in, which is easy to avoid with a little care. When there is a bottleneck (not often) its usually at the bridge or in front of Seddons, where the road is much narrower: and even then all that’s needed is 30 seconds patience. It would be a shame if Bampton ended up the same as Dulverton with its parking….the traders in Bampton need everyone’s support, a traffic enforcement officer will cost Mid-Devon Council and they will then need to recoup that money, so meters will follow and no doubt and attempt to take over the car parks….the people that complain (if they did) will hopefully gradually learn that the slower pace of life in Bampton and other small villages is what Devon is all about and if they have caused parking enforcement to become an issue they will live to regret the gradual loss of the shops in Bampton and the extra cost of driving to shop elsewhere just as those others of us that know and appreciate the situation already realise. This happened exactly the same in Sandwich in Kent (small market town) where I originally came from….although it was quite funny to see the octiginarian rotary club members super-gluing the parking meters the day after they were installed.